Since yesterday, prisoners in at least 11 of California's 33 prisons are refusing meals in solidarity with a hunger strike staged by prisoners in one of the system's special maximum-security units: the Security Housing Unit at Pelican Bay State Prison. The strike began Friday when inmates in the Security Housing Unit at Pelican Bay State Prison stopped eating meals in protest of conditions that they contend are cruel and inhumane. "There are inmates in at least a third of our prisons who are refusing state-issued meals," said Terry Thornton, a spokeswoman for the California Department of Corrections and Rehabilitation. The number of declared strikers at Pelican Bay — reported Saturday as fewer than two dozen — has grown but is changing daily, she said. The same is true at other prisons. Some inmates are refusing all meals, while others are rejecting only some, Thornton said. Some were eating in visitation rooms and refusing state-issued meals in their cells, she said. Assessing the number of actual strikers "is very challenging," Thornton said. Prison medical staff are "making checks of every single inmate who is refusing meals," she said. 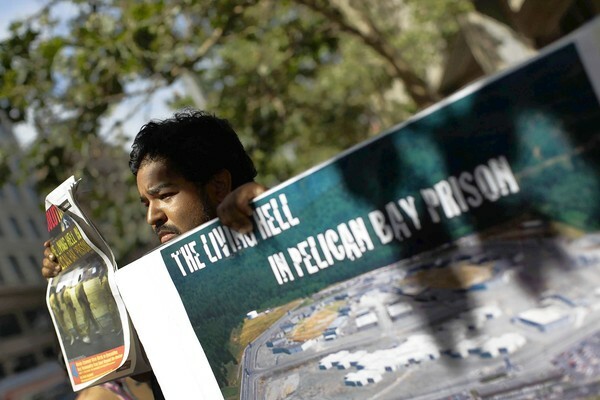 More than 400 prisoners at Pelican Bay are believed to be refusing meals, including inmates on the prison's general-population yard, said Molly Poizig, spokeswoman for the Bay Area-based group Prisoner Hunger Strike Solidarity. The group had received reports on the strike from lawyers and family members visiting inmates over the weekend, she said. The group's website claims that prison officials attempted to head off the strike by promoting a Fourth of July menu that included strawberry shortcake and ice cream. According to the website, the wife of a Security Housing Unit inmate said her husband had never had ice cream there and "has never seen a strawberry." Inmates at Calipatria State Prison — with more than a thousand prisoners — were among those reported to be refusing meals, Poizig said. Prison officials could not be reached for comment. But Thornton acknowledged that inmates at the prison were refusing to eat state-issued meals. The strike was organized by Security Housing Unit inmates at Pelican Bay protesting the maximum-security unit's extreme isolation. The inmates are also asking for better food, warmer clothing and to be allowed one phone call a month. The Security Housing Unit compound, which currently houses 1,100 inmates, is designed to isolate prison-gang members or those who've committed crimes while in prison. The cells have no windows and are soundproofed to inhibit communication among inmates. The inmates spend 22 1/2 hours a day in their cells, being released only an hour a day to walk around a small area with high concrete walls. Prisoner advocates have long complained that Security Housing Unit incarceration amounts to torture, often leading to mental illness, because many inmates spend years in the lockup. Gang investigators believe the special unit reduces the ability of the most predatory inmates, particularly prison-gang leaders, to control those in other prisons as well as gang members on the street. Prison administrators are meeting with inmate advisory councils to discuss the inmates' complaints, Thornton said. But "I have not heard there's been any decision" to modify policies governing the Security Housing Unit, she said. "A lot of those policies have been refined through litigation." Also, on that page is a link to this story about an ongoing(?) prisoner strike in Ontario. However, I can't for the life of me find any other news stories about it.